Do you think we like Indonesia? Well, it is the only country we plan to spend a whole semester. So do you think we love it? We are scared of never leaving it once we get there. When Sarah and I where debating what to do with our lives, one option was to move to Bali, the other one was to sail around the world. This is how much we love this country. Indonesia is the perfect combination of good food, friendly people, eastern culture, perfect-perfect-perfect waves, great diving, reasonable prices and great weather. In the late 80’s Brazilian magazines started to show some quite remote and amazingly beautiful locations to surf, and as a young and curious surfer, Bali was the one which caught my attention the most. It took me decades to make my first trip to Indonesia, but since then, it has been my favorite international destination. 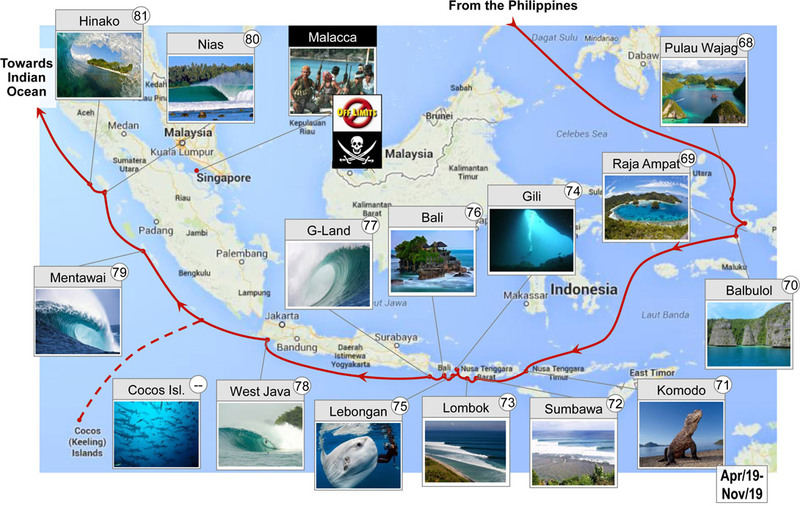 While Indonesian waves have been greatly explored, I guess there are still a few surf spots that has not been surfed by many.